Welcome to Issue 10 of SHAPE Journal. The next couple of issues of this Journal will begin two different series concerned with the most important questions that now confront scientists today, and must be immediately and seriously addressed. They may not be widely agreed with, but even in the most complacent corners of our discipline there are clearly rumbles of disquiet - may I mention the Large Hadron Collider? What is Emergence, and what drives it? What actually causes such interludes to create the wholly new, and what role do they play in the undoubted and continuing Evolution of Reality? These are not new questions. Their answering has traditionally been the sole province of religion - but such place-holders for explanation will no longer suffice, and as cataclysms (such as the 2008 bank crash) and revolutions of all sorts increase in number, truly scientific answers must be found, which will allow us to begin to understand such processes. They cannot be left to belief! These ever present questions regularly beget "simple" answers, and the favourite one at present is that which is termed Mathematical Chaos (or its immediate offshoot Complexity) will finally deliver the required Order at the Edge of Chaos, and will demonstrate how everything wholly new is "brought-to-birth". Such a misplaced "causality" can, of course, never be correct. For all mathematics (including Chaos) is a man-made construction, about Form alone (a consequence and not a cause of phenomena). But the enticing ingredient of unpredictability is, as it has always been, seductive, and is set to replace the previous panacea of Total Randomness as the source of all qualitative change and development. We are now delivered of this new and final source to deliver all significant and creative changes. Now such a supposition is total rubbish! As a mathematician, myself, who was part of a multi-discipline research team into Chaos, many years ago, I know that this phenomenon is about the breakdown of stability, and as such it never transcends that stability to bring in something both higher and entirely new. It remains totally contained within the current level of stability, and is limited to Form alone. It certainly could not produce Life or any of the other products of a true Emergence. So here we begin the fairly long process of demolishing this myth (do you perhaps remember Catastrophe Theory?) 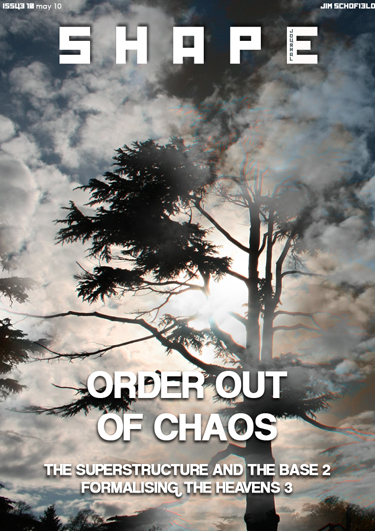 with the paper Order Out of Chaos? in this issue. It is by no means the final word on the subject, and since writing it in August 2007, a great deal of subsequent work has been produced both on Chaos and Emergence, and they will appear within future editions of this journal. To deliver them now would be premature, and probably present more questions than appear to be answered. They are the culmination of a series of developments, so the intervening papers will also be published in the order in which they were written. They will hopefully elicit more responses from our readers, for this is too important an area to be limited to a single contributor. If you would like to respond to these ideas, please send us your thoughts to shape@bild-art.co.uk, and we will consider your contributions for publication. Happy reading!